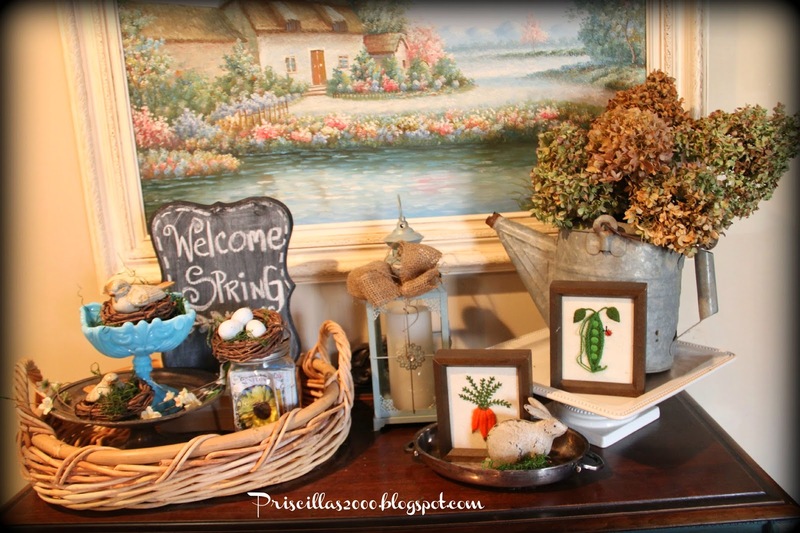 I have loved creating a few spring vignettes in our family room ! 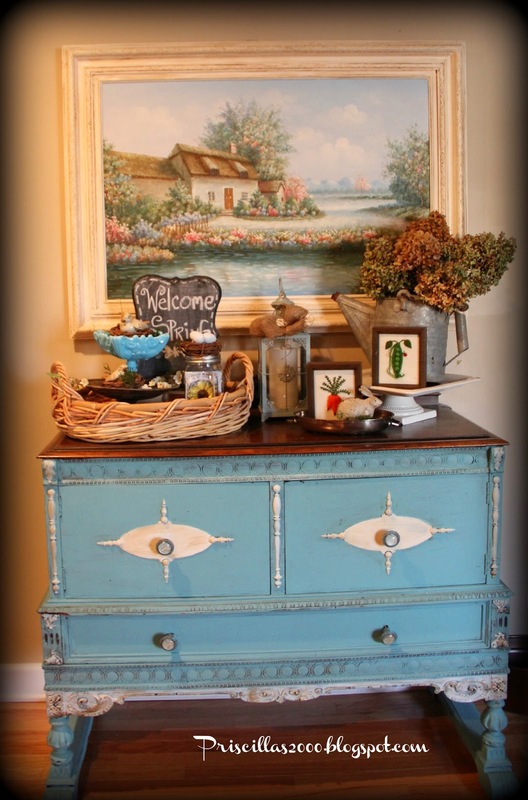 We have this vintage sideboard that my daughter and I chalk painted ( it was our first chalk paint project !) I moved this painting that I bought at a garage sale for $10.00 over the sideboard.. Last week my youngest son told me this painting has his name on it .. so he looked it up on Ebay and for this size similar painting from this artist they are $650.00 to $750.00 ! The frame was gold and I painted it cream ..It also had one of those gallery lights mounted to it that I took off. Lats week my daughter and I went to an estate sale and the only thing I found was these two little vegetable stitcheries .. They were $ 1.00 each and dated on the back 1974 ! 40 years old ! 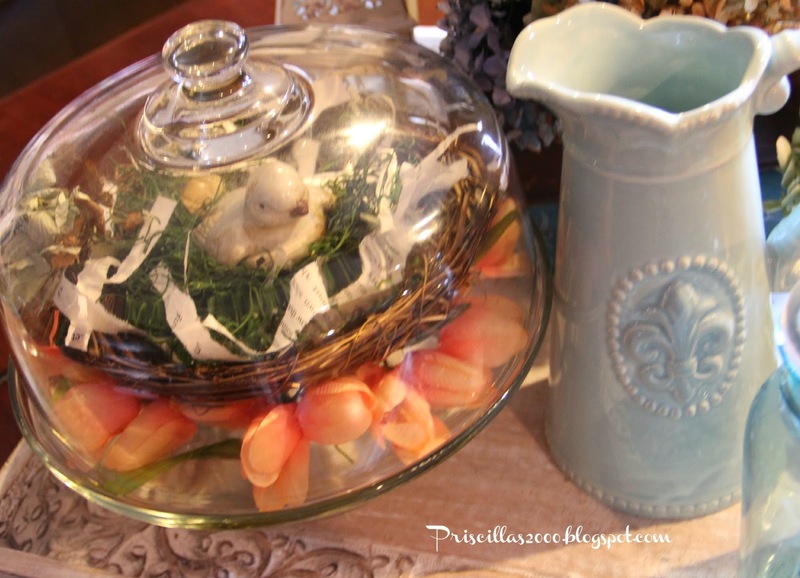 Aren't they a cute addition to spring decorating ?. 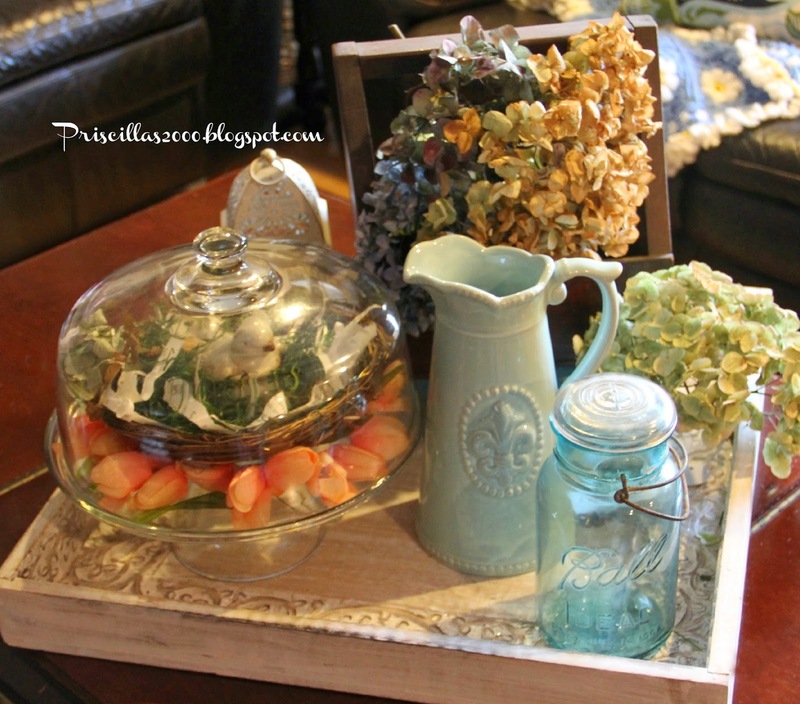 A vintage watering can filled with dried hydrangeas is on a pedestal plate. 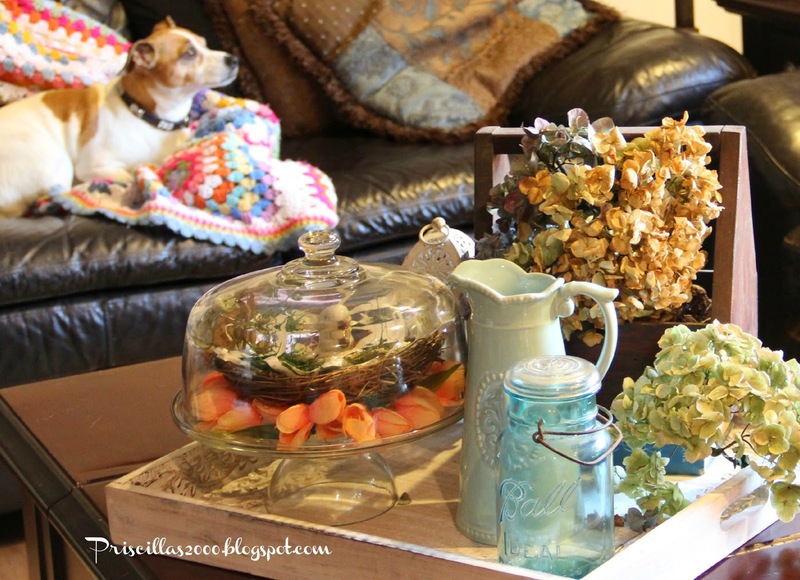 On the coffee table I have a wood tray filled with a cake plate with tulips and a birds nest , a aqua pitcher, some dried hydrangeas in a vintage tool box and a vintage mason jar.. 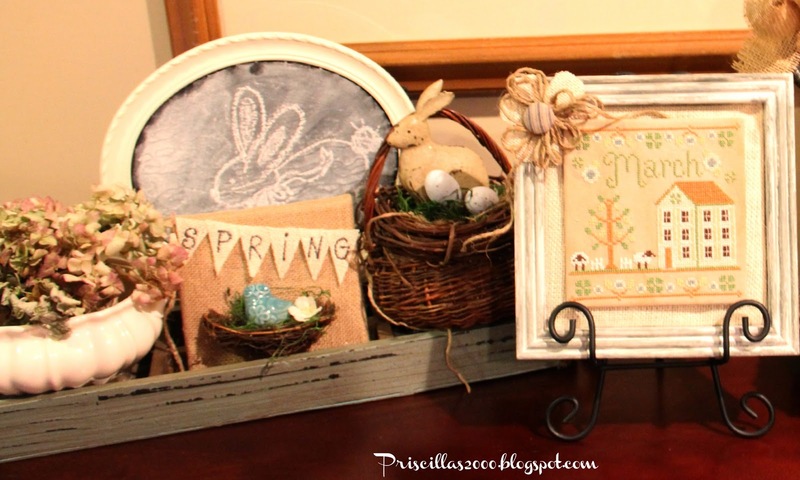 I filled this little wood tray with a basket with a nest , bunny and eggs..a little burlap piece we made with a nest cut in half and glued on with a little spring banner and a ceramic bird..the thrifted frame has a bunny on it for the spring..and some dried hydrangeas in a thrifted bowl. Thank you for the chalk paint information. You found some great deals on your painting and vegetable stitchings. Very cute! Beautiful! I especially love how you painted the sideboard. love the way it looks. Those little stitch projects were a great find! 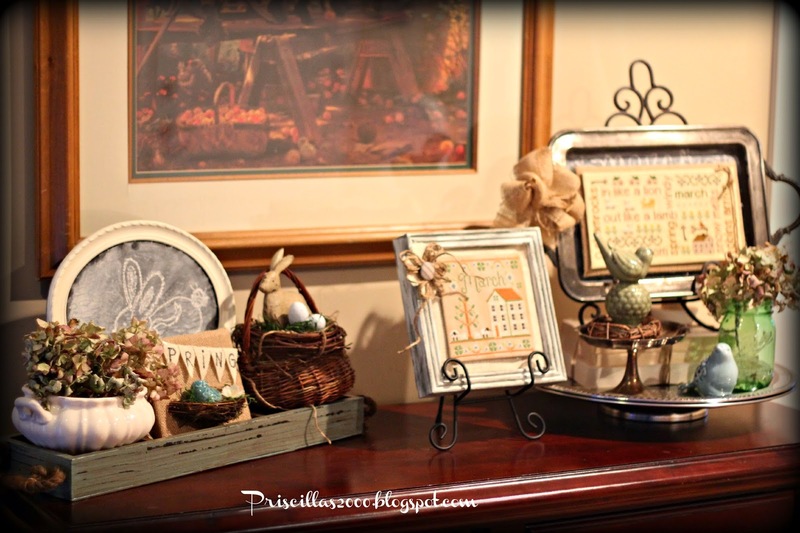 How pretty everything looks, Priscilla--love your little bunny you drew on the chalkboard frame. So cute! All of your vignettes are just wonderful, Priscilla. 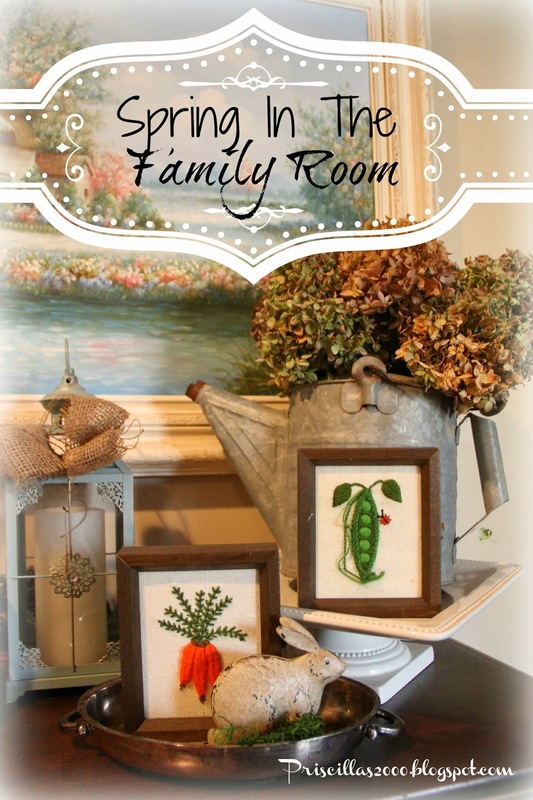 You've included all of the elements that I love - hydrangeas, the old watering can, the chalkboards and bunnies! Can't forget the bunnies. lol How clever to cut a nest in half. BTW - that would have been me embroidering the veggies back in to 70's. I used to spend hours embroidering and cross-stitching in those days. 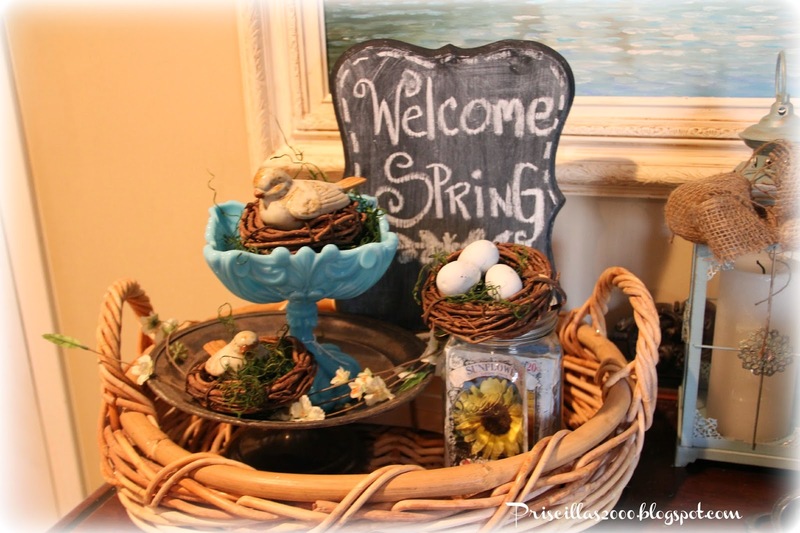 Thank you for linking up to Swing Into Spring and happy first day of spring! Priscilla, you always do such a wonderful job! I have to tell you, the little vegetables are the first things that caught my eye. I was sure you had made them. Is your painting a Robert Kinkade? Love the frame painted white. Hoping to pull out my Easter next week. Forgot to say thanks for linking to SYC. Really cute! 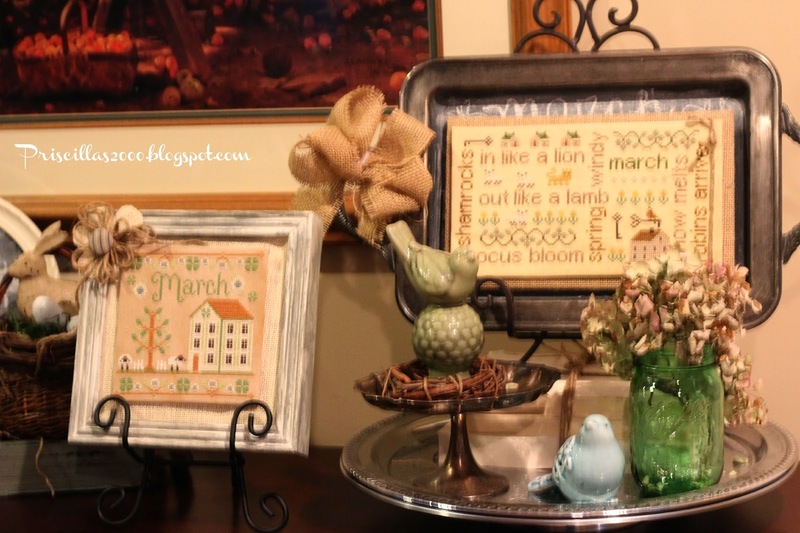 I love decorating for Spring. It has been a long winter. Happy Spring! I have to tell you I did a set of four of the little embroidered vegetables myself in the seventies. I got rid of them along the way but now wished I had saved them. If you do any handwork keep it regardless if you think it is dated. Any handwork you personally do should be kept. Your vignette is darling and caught my eye immediately. How pretty! I really love the framed carrots. If you have not shared yet on Bacon Time Anything Goes linky please do. Have a great week. Hi there. I am visiting from BNOTP. Like several of your other readers, back in the 70's, I also made that set of four embroideried vegetables. I made them as a gift for my parents, who were both avid gardeners. My set was also framed in those same wood frames. You are missing the ear of corn, and the broccoli stem, so keep your eyes open at future sales. The set I made is still hanging in the kitchen of my Mom's home. Your display brought back some nice memories. Thanks. Great touches and love that aqua bowl! 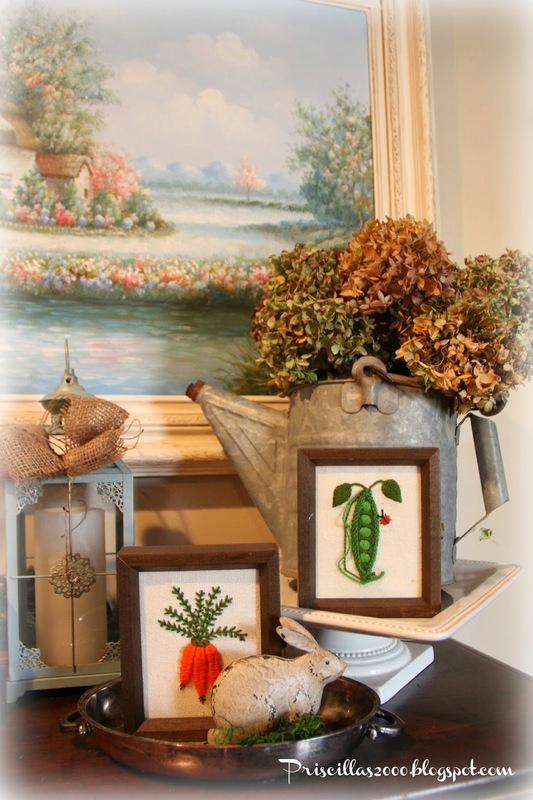 The stitched veggies are wonderful and just perfect for thinking of spring! Everything looks great! I like how you highlighted your stitching.